Melt 1/4 cup (4 tbsp) of the butter; place in medium bowl. Add cookie crumbs and sugar; mix well. Press crumb mixture firmly into bottom and side of 9-inch pie pan and set aside. Microwave chocolate and remaining 2 tbsp butter in bowl on high for 1 minute or until butter is melted; stir until chocolate is completely melted. Drizzle evenly onto bottom of crust; top with bananas and set aside. 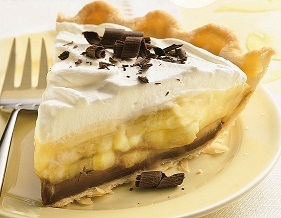 Prepare dry pudding mix with 1-3/4 cups cold milk as directed on package for pie; pour evenly over bananas. Whip the cream with 2 tsp sugar and vanilla. Just before serving top pie with whipped cream and chocolate shavings.